As a new believer I tried to look like my friends who were older Christians. When I noticed that others underlined and took notes in the margins of their Bibles, I bought colored pens and began rather randomly underlining verses too. Unfortunately, I had no idea how to study the Bible, and my actions were mainly for appearance sake. Finally, something in the Bible made sense! I recognized this verse immediately as a description of my life. I underlined that verse twice. Being a new believer was confusing. Sometimes, I wondered if I should pray that sinner’s prayer again, because I wasn’t sure it took the first time. My personality had not undergone the radical overhaul I was hoping for. Finally, someone acknowledged that the Christian walk is a mixture of triumph and tragedy. And it was a biblical author! Romans 7:15 is part of Paul’s explanation of the the purpose of the Law. In Romans 6 Paul began answering the objections to the gospel. 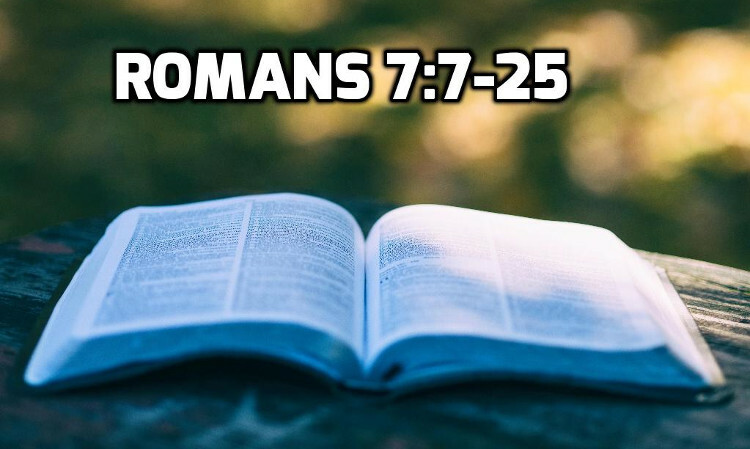 In Romans 7:7-25, Paul deals with his third question. If the Law only gives us the opportunity to do evil (7:1-6), then the Law promotes evil behavior and the Law must be evil and destructive. We know that the Law was given by God Himself, so it could not be evil and destructive. So, Paul, your gospel must be wrong. The Law is a good thing because the Law alerts us to our sinfulness, so that we can trust in Jesus and be saved. Paul argues, without the Law of God, we would not understand how sinful we are and how we are unable to save ourselves from sin. The Law — just as God intended — alert us to the death that threatens us so that we might turn from our selfish ways, see our need for a savoir and trust in the work of Jesus. Suppose you and your friends are peacefully drifting down the middle of a wide river in a rubber raft with no oars. You have to float down the river; there is no getting out of it. But it’s sunny and quiet; the birds are singing, and there are shady trees and fluffy clouds. Everyone in the raft is having a great time. Everyone except the one person who looked at the map. She knows that around the bend is a huge waterfall and all of you are going to get swamped. The sun is still out, the birds are still singing, and the others are having a great time. But she is miserable, unable to enjoy the anything about the trip. Finding out didn’t make the situation more deadly, it just made it worse to experience. Her perspective has changed because now she knows about the danger ahead. Similarly, the Law functions like her map; it alerts her to the danger so she can change course.